The flagship of our wireless CCTV range. The image-quality, transmitting range and low-light performance of the OmniSight system are quite extraordinary, and we have yet to find its equal on the UK market. We put it together here in the UK, and are more than happy to guarantee it for two years. 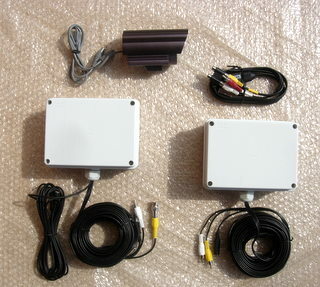 It comes as a complete wireless kit incorporating the following: 1 x external high resolution colour IR camera; 1 x weatherproof CCTV transmitter; 1 x indoor receiver (4 channels); 2 x 12V power adaptors; Complete set of leads. Transmitting range with the little stub aerials provided is 100m in ideal conditions. This may be increased using one or more yagi antennae, and we've had reports of reception of a mile or more. Cameras, transmitters, digital video recorders and antennas may be added, and are listed separately. A printable brochure is available here.